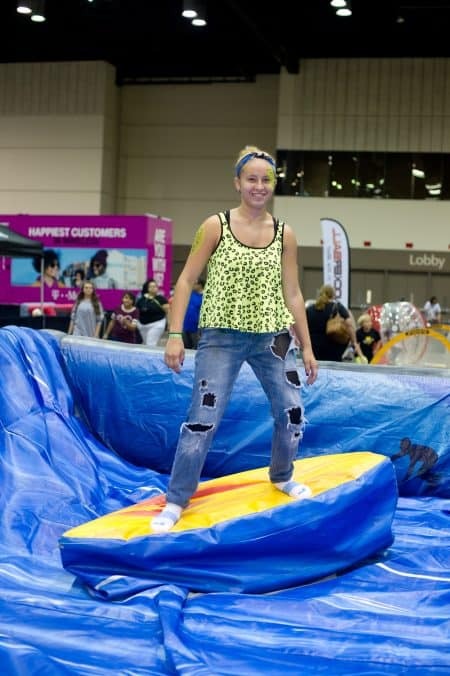 How much does the Florida Kids and Family Expo Cost? Advanced Tickets are $6 each (ages 3+). Tickets at the door are $10 each (ages 3+). Most activities and interactions are included, but a list of those (and extras are below). Does it cost to park at the convention center? Yes. But, it is discounted to $10. We wish it was free too! While some activities, bounce houses, attractions will have a nominal fee to participate (see below), there is more free fun to enjoy that you can accomplish in a day! Giveaways and Prizes – INCLUDED! Character Meet and Greets – INCLUDED! Live Stage Performances (2 STAGES) – INCLUDED! Aerial Act Performances – INCLUDED! What is an additional cost? We work to include as much as possible with every admission, but some experiences have hard costs that can’t be made up by low attendance fees, so there are additional nominal fees. *This fee covers rental, staffing, electric, and donations to New Hope for Kids. *This fee covers the cost of the food. *This fee covers power, staffing, and transportation of the train. *This fee covers transportation on ponies, feedings, staffing, and housing. Those are the only fees we’re openly aware of. Face Painting, tattoos, toys, books, additional products, tickets to venues around Central Florida, additional services. *This is a 2-day buying event for families if you find products, services, entertainment, etc. that would enrich your family. Yes. There will be some samples of food, but food will be available for purchase through CenterPlate Catering Karts. These karts are not associated with the expo, but are provided through the convention center. Can I bring snacks and/or drinks? Yes. As with the theme parks, if your kids/family need to bring their own waters/drinks and/or snacks, this will be permissible at this event.